A TRIP to craft store, Spotlight, was part of the development process when Nathan Roy was refining the equipment used to deliver beneficial insects via drone technology. The former strawberry grower of 20 years saw a greater need for unmanned aerial vehicle (UAV) use in agriculture. During his presentation at the Future Farming Masterclass at the AgroTrend field days at Bundaberg recently, Mr Roy explained how watching his workers standing around rather than manually delivering the beneficial insects onto his strawberry plantation was a motivator to investigate a new way. “They may have been just standing off under the trees looking at Facebook or whatever,” he said. While his tractor guided itself down the GPS-tracked rows, Mr Roy began investigating and eventually purchased a UAV. 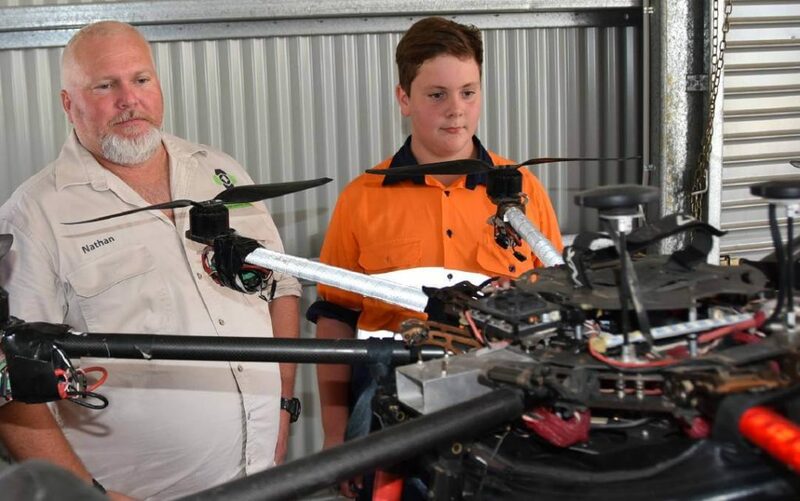 He then took a trip to his local Bunnings store and bought a standard handheld Scott’s fertiliser spreader in order to use the internal mechanism to mount on the base of the drone. The trip to Spotlight came about in search of a material to create a collapsible bag that could attach to the device. Despite going back to the drawing board several times, Mr Roy continued to hone his advanced tools, eventually engaging a draftsmen to help design his current system, which he now uses for his business, Aerobugs, based at Beerwah, Qld. Mr Roy’s use of technology within his business continues; he uses a 3D printer to create his spreader baseplates. Mr Roy said he has been employed to work in many different crops including strawberries, stonefruit, Brussell’s sprouts, pumpkins, cotton, macadamias, watermelons, sweetcorn and grapes. In fact, the popularity of his service has grown to the point of now servicing 90 per cent of the strawberry growers in South Australia. Aerobugs also provides normalised difference vegetation index (NDVI) imaging and GPS waypoint plotting, to help with farm management decisions.